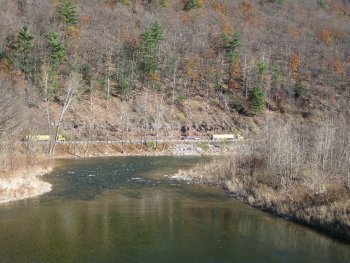 On Wednesday, November 10, 2010, I rode my bicycle along the Pine Creek Rail Trail from my home in Torbert Village north to Slate Run, a distance of roughly 24 miles. Up the eight miles to Waterville, I experienced literally nothing, it seemed to me, but the constant noise of Marcellus shale gas-related truck traffic going up and down Route 44, which parallels Pine Creek and the rail trail. This din of truck traffic has been going on at the almost unbelievable rate (not unbelievable to those who live here) of 500-1000 trucks (many of them 18-wheeled water tank trucks) every 24 hours, 7 days a week. And this will, from what I’ve learned, continue for years. Over the bridge across Pine Creek just above my home, up the four miles to the old Camp Kline Boy Scout grounds below Ramsey Village, over the bridge across Pine Creek into Ramsey, past the small rail trail parking access at Ramsey (a REAL danger to park there anymore, with the trucks barreling past there and the very limited view, especially to the south, to exit from there), up the three miles to Waterville, through Waterville, across Route 44 just above Waterville (a very dangerous crossing now), past the Waterville Parking Access for about a quarter mile above mile-marker 156—you hear the constant rumbling of the incessant truck traffic. This particular Wednesday was a beautiful, sunny day, with the temperature climbing into the 50s, wonderful for a bicycle ride in mid-November. And about all I experienced during my ride to Waterville was my anger, my frustration, my despair over the unending roar of passing trucks. When I finally got above Waterville, I experienced a dramatic change. Peace, quiet, serenity. The only sounds the rustling of the fallen leaves, the whispering of the wind as I pedaled, the gurgling of Pine Creek, birds singing, the pleasant sound of my bicycle tires crunching leaves and rolling over the fine trail stones. It was like this all the way to Slate Run, with only a very rare vehicle passing by on Route 414, and absolutely no trucks. Outside Wolfe’s General Store in Slate Run, I ate one of their delicious Panini bread sandwiches at a picnic table. It was a quiet, relaxing lunch stop, sitting there with the warm sun shining down on me. The serenity continued for me all the way back down to Jersey Mills and below. I really didn’t want to approach Waterville, knowing that all would change. And it did. My communion with Nature ended abruptly with the renewed assault on my senses by the infernal, blaring, dust-raising, polluting “Marcellus” trucks. My heart rate rose, I know, along with my anger, and I pedaled furiously the remaining eight miles back to my home in Torbert Village. Even there, inside my house several hundred yards from Route 44, there is no refuge from the constant din that plagues the 12 miles from Jersey Shore to Waterville.